We took a day to meet up with the aforementioned Bumfuzzlers, who are just finishing up their trip.Â This turned into quite a long day/night/morning of boozing it up. We started out at Quitoâ€™s Gazebo, a relatively famous bar at fairly scenic Cane Garden Bay.Â Quito is Quito Rhymer, a local reggae star, who plays live most weekends.Â We were there during the day, and it was dead, but Iâ€™m sure itâ€™s pretty hopping when he is playing.Â We then ventured on to the fairly famous Bombaâ€™s Shack, a beach bar made mostly out of driftwood.Â Itâ€™s probably great for the Full Moon Party, but itâ€™s otherwise just license plates, underwear, graffiti, business cards, and drunk charter vacationers â€“ bars like this are, sadly, a dime a dozen.Â We had a great time with Pat and Ali, but none of these bars is reason enough to re-route oneâ€™s boat (or life) toward Tortola. A different day, we also made it out to the infamous Willy T. at Norman Island.Â I totally loved it â€“ my favorite watering hole weâ€™ve yet visited. Melissa doesnâ€™t agree â€“ at all.Â As I said before, there are only two things to do in Tortola â€“ sail and drink. As far as weâ€™re concerned, Tortola really is no better than O.K.Â We both doubt that weâ€™ll ever set foot on the island again.Â Itâ€™s totally skippable unless youâ€™re coming specifically to GO SAILING.Â Once you put all the sailing business to the side, it is not somewhere Iâ€™d choose to be stuck for longer than an afternoon cruise-ship excursion (not that cruise-ship excursions are in our future, but, boy, there sure are a lot of people taking them in Tortola).Â Road Town, the main town, is decidedly not charming.Â We were told that Tortola is a sailing â€œMecca.â€Â Indeed it is â€“ weâ€™re just not that kind of Muslim. We decided to leave Tortola around 2:30 p.m. yesterday and head for Jost van Dyke, the nearby â€œout islandâ€ that is home to two legendary beach bars â€“ Foxyâ€™s and Soggy Dollar Bar — and very little else.Â The thought was that weâ€™d get to JvD around 4:30, anchor the boat, dinghy ashore, check out of BVI customs and immigration, have dinner and a few drinks at Foxyâ€™s, dinghy back out to the boat, and sail overnight to St. Martin. We actually managed to get off the dock just after 2:30.Â It was strange saying good-bye to three different boats we had encountered in multiple locations already, knowing that, this time, we were unlikely to see them again.Â I suppose we should get used to that. Having FINALLY gotten our batteries replaced, we now no longer need to be tied to something hard â€“ we can finally â€œanchor outâ€ like proper sailors. Anchoring is surprisingly difficult for many, many sailor â€“ it is probably the one thing that most boat owners are slightly afraid of, and for good reason.Â People often times make complete â€¦ well â€¦ spectacles of themselves as they attempt to park the boat. I am pleased to report that our maiden anchoring was absolutely flawless.Â We planned it out well and executed it perfectly.Â This was a strong point for each of us back in sailing school, and, apparently, we remember what we were taught. 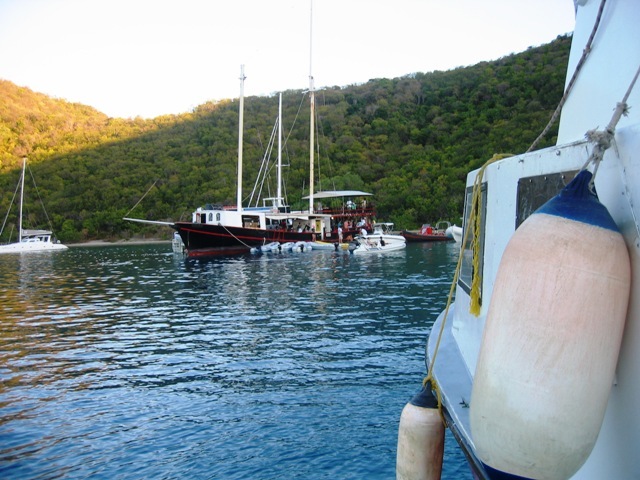 Our maiden post-anchoring dinghy ride, however, was not so flawless.Â We managed to get the dinghy to Foxyâ€™s dock right at 5:00.Â Melissa jumped off and sprinted for customs.Â Alas, we had missed them.Â So, weâ€™d have to stay overnight â€“ no big deal.Â St. Martin can wait one more day. 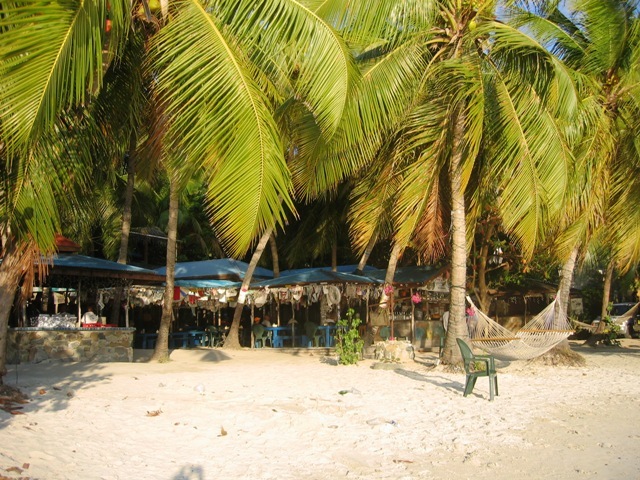 Foxyâ€™s might be the single most-famous beach bar in the entire Caribbean, if not the world.Â We felt like we â€œneeded to do itâ€ but expected to be put off by excess commercialism in the vein of Hard Rock CafÃ©.Â Boy, were we wrong. Yes, it has a very large T-shirt shop/boutique, and they do a very brisk business.Â But Foxyâ€™s puts out a tremendous product.Â The bar is great.Â The drinks are creative and tasty.Â The staff is fantastic and professional, and the food was surprisingly delicious.Â We were a little bit hesitant to pay $28 apiece for a â€œBeach BBQ,â€ but this was fantastic food â€“ ribs of near-Twin Anchors quality, the best jerk chicken either of us have ever had, corn that was downright memorable (now thatâ€™s saying something).Â It was a bargain at twice the price.Â Foxyâ€™s certainly doesnâ€™t need me to tell you how great it is.Â The word is already out.Â But it isnâ€™t popular by accident. â€œSeveralâ€ (ahem) Dread Fox cocktails later, we walked down to the dock to get on the dinghy and head back to the boat. It was sinking.Â Seriously â€“ it was SINKING!Â The left pontoon was basically flat and submerged.Â We got into the boat, thinking we might just be able to make it back to Spectacle.Â Totally wrong.Â All we did was make it worse, instantly. Melissa jumped back on the dock, losing a flip-flop, grabbed the waterproof bag, as we prepared to â€œsaveâ€ the outboard.Â I jumped into the water â€¦ which, thankfully, was only about four feet deep.Â I managed to wrestle the outboard off the boat and onto the dock, and we eventually retrieved the boat as well and dragged it onto the beach.Â However, itâ€™s pretty clear that weâ€™ve got a fairly meaningful â€œslow leakâ€ in the dinghy (and not that slow, apparently).Â Add that to the list of repairs.